It is nearly October. My jersey is itching to come off the hanger as the calendars nears what is supposed to be the 1st game of the year. I do still have hope [yes you may think I’m naive but I choose to be optimistic despite all the naysayers!] that the season can be salvaged. It has only been 11 days since the lockout was officially enacted…but each day that passes as more players sign abroad and as players that are exceeding abroad is only making me miss the game even more. Yes there are other leagues…but none have quite the hold on me that the NHL or my Canucks do. There is a flickering of hope [yes hope…don’t call me naive, I’m only choosing to be optimistic rather than pessimistic!] as CBA talks are set to resume Friday between the NHL and the PA. It is time to just simply get a deal done. Will everyone be happy with the results when that day comes? Probably not…but someone is eventually going to have to cave before any progress can made. The word lockout is not a welcome one in my vocabulary. Yet it has forced its way into it…and refuses to leave as long as this war of words continues between the NHL and the PA. 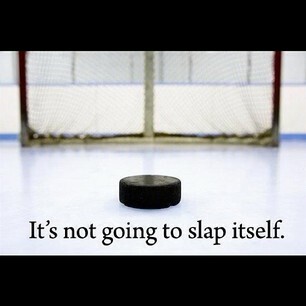 The puck is not going to slap itself…let’s get a deal done so WE can ALL watch the game WE ALL love!! Check out the link below for an awesome video montage that perfectly captures the game we all love:). All credit goes to ‘allisonwearsorange’ for creating this collection of great hockey moments:). The players may be locked out, but we the fans simply miss the game and moments we love like the ones in this video. Plus who doesn’t love the Springsteen vocals backing the video? Warning…this video may make you miss the game even more! The players may be locked out but that doesn’t mean we stop being fans of the game and all the great moments that it has brought. The players may be locked out but that does not stop me loving the game. I may not be a fan of the politics that are responsible for delaying the game, but I am a fan of the game. When the game returns I will still be a fan. I look forward to all the moments that a new season brings….moments that some may predict and others that will completely take us by surprise. I look forward to the season that still yet to come [albeit a shortened one] and all the moments that will make us gasp and say “Did that just happen?” or make an entire arena stand on their feet in a state of absolute joy as their team has just scored the winning goal in sudden death overtime! Does it really matter who is right any more in this war of words between the two sides? [maybe that Detroit exec is regretting his comparison of the players to cattle after his $250,000 fine? Seriously? the players are cattle and the owners are ranch owners? That was definitely an unnecessary low blow.] Stop throwing insults at one another and realize that the fans simply miss the game not your money squabbles. Just because we are stuck in lockout mode, does not mean that fans have forgotten just how awesome hockey is….just click to link above for a reminder! The season from the moment it begins is unpredictable, each team will have its own ups and downs, each will have a stretch drive to the playoffs, and 16 teams will fight tooth and nail to make it to the final before ONE team wins it all. Do not rob the fans who have ALWAYS been loyal to the game. Get a deal done so we can all once again race to the arenas or race to watch the games with friends and family. Once again we can all go crazy together as we always do when the game is on and our team or favourite players are scoring goals and winning games. Bring back the game. Bring back the unpredictability. Bring back the ups and downs. Bring back the season. Bring back the simplicity that was the game. Bring back a deal that will unite the owners and the players. Bring back the 2012-2013 season so we can ALL celebrate a great season into June. October is around the corner and usually that means the city is taken over by blue and green everywhere you look. Game days bring out everyone in their game day attire and all the transit buses sport ‘Go Canucks Go’ alternating with their route number. With no games yet to be officially announced or canceled, my jersey is itching to come off the hanger and be worn. I’m ready for my October traditions to come into full force. Like any hockey fan, I just want to watch hockey again [not espn or tsn classics but new games]. I am not going to join those who have jumped onto the NFL wagon, each game is brutal with their replacement refs [their usual refs are in their own CBA turmoil] determining questionable plays that determine the outcomes of games. Just let me watch hockey again, please. I remain hopeful that a deal can be reached to salvage the season. The way I see it…a new deal must be reached before the Winter Classic[but hopefully sooner] in order for there to still be a season this year. P.S. Did you watch that video yet?!! seriously check it out..it captures many great hockey moments!! This entry was posted in 2012 Lockout, Hockey, Long Reads, NHL and tagged hockey, lockout, NHL, NHL fans, October by sarahlaug. Bookmark the permalink.